This course is offered jointly by UTS: Information Technology and UTS: Business and is awarded with two testamurs. The information technology component provides a sound education in all aspects of computing and information technology for students who intend to make a career in the profession. The business component provides students with the knowledge, competencies and values necessary for fulfilling an effective career in business. Graduates with solid IT skills who also understand business operations are in strong demand in industry. This combined program allows students to gain two degrees, leading towards a career in business IT operations in only four years. The aim of this course is to prepare graduates to apply an in-depth knowledge of information technology to the business activities of an organisation. Depending on the majors selected, career options include accountant, advertising consultant, analyst/programmer, banker, business analyst, economist, financial planner, information systems developer, ICT business analyst, IT project manager, management consultant, marketing manager, network specialist, software developer, systems analyst and web developer. Successful completion of the UTS Insearch Diploma of Information Technology or Diploma of Business with a minimum weighted average mark of 60 and no more than two fail grades guarantees admission to this course with up to 48 credit points of recognition of prior learning. Students admitted through the UTS Insearch pathway are eligible for 48 credit points of recognition of prior learning. Students who have completed a relevant diploma at TAFE NSW may be eligible for recognition of prior learning if subjects previously completed are equivalent to existing UTS subjects. The course duration is four years of full-time study. Some subjects may be offered in an optional Summer session so that students can fast-track their studies. Students are required to complete 192 credit points, comprising 96 credit points in business and 96 credit points in information technology. 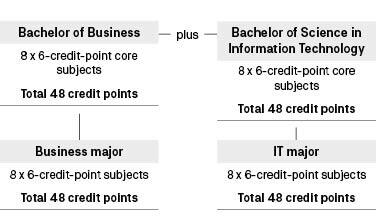 The business component consists of core (48 credit points) and a business major (48 credit points). The information technology component consists of core (48 credit points) and an IT major (48 credit points). The sample programs below show a suggested sequence of subjects for each IT major with the Finance major (as the Business major) for a full-time student. Students in other Business majors follow a similar sequence. The programs are intended as a guide only and do not take into account such factors as recognition of prior learning, changes in attendance mode and subject availability, or satisfactory academic progress. Students should consult the Timetable Planner to confirm the availability of subjects in the current academic year. The Bachelor of Science in Information Technology may be awarded with distinction, credit or pass. Refer to the Bachelor of Business (C10026) for details on levels of that award. Students interested in research and who excel in their studies are eligible to undertake one additional full-time year of study in the Bachelor of Science (Honours) in Information Technology (C09019) or the Bachelor of Business (Honours) (C09004). The honours year is also available on a part-time basis over two years. Refer to the Bachelor of Business (C10026) for details on professional recognition of that award.